A warrant is an official, enforceable, legal demand. Depending on the type of warrant, the document calls for a person's appearance before a court (an arrest warrant or bench warrant). Search warrants are court-approved investigations into crimes that allow police to enter a home or place of business to seek and remove evidence. Other types of warrants are used in government and finance (stocks) but in that context they refer to certified documents, not criminal proceedings. Warrants are important components of criminal trials because they enable police to put pieces of information together in building a case against someone accused of a crime. Warrants are also a safeguard against the wrong person being tried and perhaps jailed unnecessarily. Police officers must collect evidence, whether witness testimony or physical traces like fingerprints, to solve crimes. When they reach a certain point they will ask a judge or magistrate for a warrant to either search for physical items related to the crime or for an arrest warrant to bring the alleged criminal to plead his innocence or guilt in an arraignment before the court. This is done in conjunction with the District Attorney's office that actually brings cases to court. 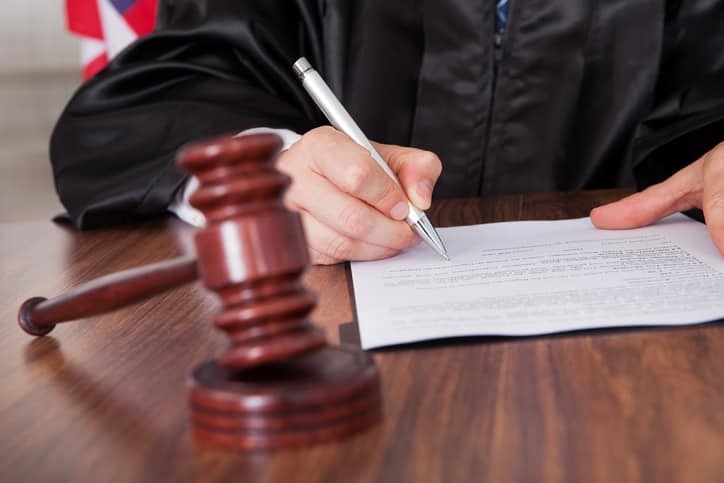 Warrant applications that police take to a judge for approval must be specific and will often contain explicit eyewitness testimony about what took place or who was seen committing a crime. The warrant application must detail everything known about the suspect to ensure there is no mistaken identity. If a suspect can prove that the warrant included errors the court may invalidate the arrest or the collection of evidence, in the case of a search warrant. Warrants are kept secret until police act upon them. Because the information contained in a warrant often includes the identities of witnesses and other information important to a criminal prosecution, police do not reveal warrants to the public. If a warrant is used to arrest a person, the arrest becomes public information unless the individual is a juvenile and protected by shield laws. Individuals wanted on felony charges or for violent crimes are likely to be sought out by police with an arrest warrant. Misdemeanor warrants are not as important to police and prosecutors who juggle many tasks. Those with misdemeanor warrants are likely to find out about the order when they're stopped for speeding or when a background check is required for a job or new apartment. You may also search for warrants in your name or call the local police or courthouse to ask if there is a warrant for you. Paying a fine or performing other court-ordered tasks (such as completing a course) will often clear a minor warrant without a court trial. What to Do if You Discover a Warrant? Many people have outstanding warrants for minor offenses, and the implications can be far-reaching: if you have an outstanding warrant, credit checks and criminal background searches that new employers perform are likely to discover them. If you apply for a travel visa, seek to adopt a child, or are recruited to join the military, a warrant can complicate the process. Not all warrants are arrest warrants: many are applied when a fee or fine is unpaid, which requires the state to delay renewal of your driver's license, auto registration, or another privilege until the warrant is discharged or fine paid. Note that unpaid fines may also compound over time due to interest. In New York, you may not be able to sell your home if there's a warrant for unpaid taxes attached to it. Some states let warrants for misdemeanors to expire after 180 days. That doesn't mean that a fine associated with it will disappear, it simply means that the warrant is no longer active and you will not be arrested for that misdemeanor. Felony warrants never expire. Check with your state to see if unserved warrants have such limitations. Warrants pile up, year after year, and many do not expire. The backlog has forced police to selectively enforce these documents, and for states to purge thousands from their systems, abandoning attempts to serve justice. While sheriff's departments are the primary arm of warrant enforcement for courts, local police who seek warrants for suspects often handle their own. A study of outstanding warrants showed that about 80 percent of local police and sheriff's departments serve warrants but a little more than 50 percent of state police do the same. Gaps remain in reporting systems, so that a person wanted on a warrant in one jurisdiction isn't always arrested if stopped by police elsewhere. State police are likely to only have information about felony warrants, which are usually entered in the National Crime Information Center database maintained by the F.B.I. Of course immigration officials will also have access to that information, so those who attempt to cross an international border (arrive in a U.S. airport from an international trip) may also be arrested on an outstanding warrant when their passport is checked. If you suspect there's a warrant for your arrest, you should resolve it by calling the local courthouse for information. You may also search online for warrant information using RecordsFinder.com warrant search.